Auto-Tune Vocal Studio combines Auto-Tune Pro, the worldwide standard in professional pitch and time correction, with AVOX 4, the latest generation of the Antares Vocal Toolkit. For two decades, Auto-Tune has stood alone as the worldwide standard in professional pitch (and more recently, time) correction. Now, with Auto-Tune Pro, the introduction of Flex-Tune establishes a new standard of natural real-time pitch correction. Also, with Auto-Tune Pro, itâ€™s virtually impossible to know that Auto-Tune had been used on a track. For most common pitch problems, Auto-Tune 8â€™s Automatic Mode detects input pitch and instantaneously adjusts it to the closest pitch in a user-specified scale (including major, minor, chromatic and 26 historical and microtonal scales). Auto-Tune 8â€™s Graphical Mode, used for meticulous pitch and time editing, displays the performanceâ€™s detected pitch envelope and allows you to modify pitch and timing with a variety of graphics tools. This mode gives complete control over the correction or modification of the most elaborate pitch and rhythmic gestures. Low Latency Mode: Auto-Tune 8â€™s new Low Latency Mode allows for Auto-Tune use when tracking or during live performance, letting vocalists monitor their performance with no disorienting delay. Editing Tools Active During Playback: For those who prefer editing on the fly or with looped segments, Auto-Tune 8â€™s editing tools are now active during playback, so you never has to stop and restart just to hear the results of an edit. Audio Feedback of Note Object Pitch: Auto-Tuneâ€™s Note mode was already the easiest way to re-pitch already recorded melodies. In Auto-Tune 8, you can choose to have any note edits provide audio feedback of the noteâ€™s pitch, so selecting new notes is just a matter of using your ears. Also includes AVOX 4: Harmony Engine Evo, Mic Mod EFX, Mutator Evo, Articulator Evo, Warm Evo, Aspire Evo, Throat Evo, Duo Evo, Choir Evo, Punch Evo and Sybil Evo. 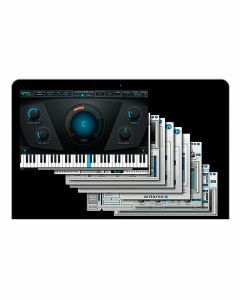 â€¢ A compatible VST host program that supports VST3 format. â€¢ A compatible host program that supports the AU format.